A static website generator combines a markup language, such as Markdown or reStructuredText, with a templating engine such as Jinja, to produce HTML files. The HTML files can be hosted and served by a web server or content delivery network (CDN) without any additional dependencies such as a WSGI server. Why are static site generators useful? 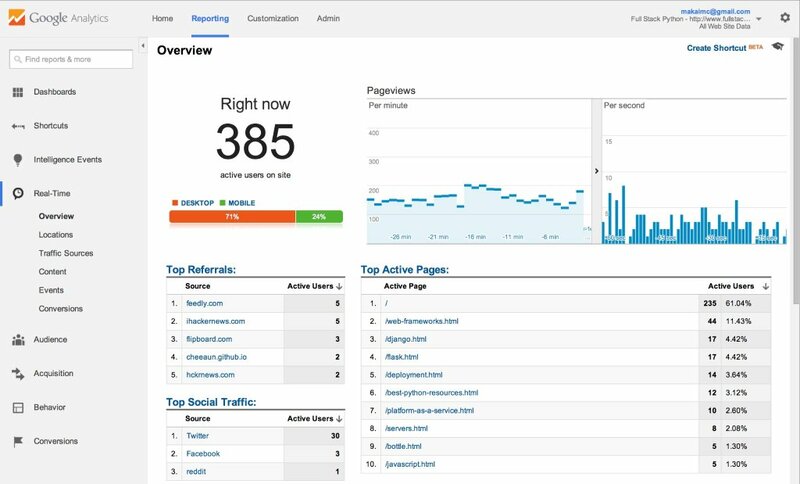 For example, when Full Stack Python was on the top of Hacker News for a weekend, GitHub Pages was used as a CDN to serve the site and didn't have any issues even with close to 400 concurrent connections at a time, as shown in the following Google Analytics screenshot captured during that traffic burst. How do static website generators work? Static site generators allow a user to create HTML files by writing in a markup language and coding template files. The static site generator then combines the markup language and templates to produce HTML. The output HTML does not need to be maintained by hand because it is regenerated every time the markup or templates are modified. 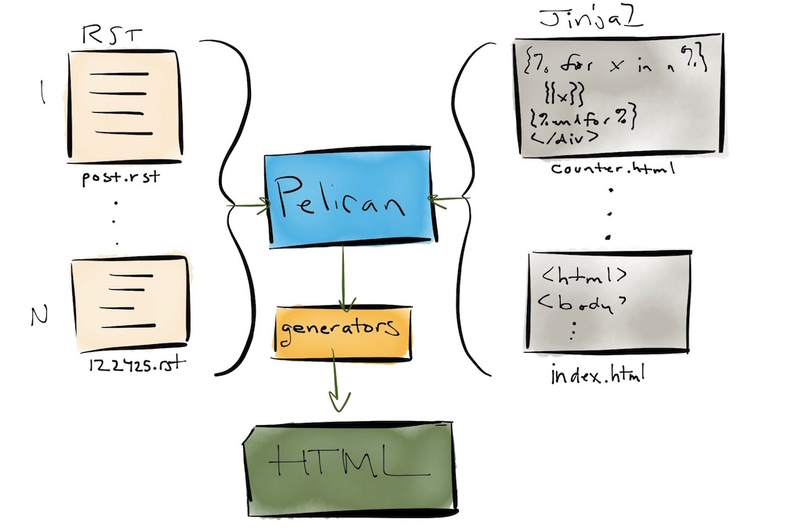 For example, as shown in the diagram below, the Pelican static site generator can take in reStructuredText files and Jinja2 template files as input then combine them to output a set of static HTML files. What's the downside of using static site generators? The major downside is that code cannot be executed after a site is created. You are stuck with the output files so if you're used to building web applications with a traditional web framework you'll have to change your expectations. Content that is typically powered by a database, such as comments, sessions and user data can only be handled through third party services. For example, if you want to have comments on a static website you'd need to embed Disqus's form and be completely reliant upon their service. Many web applications simply cannot be built with only a static site generator. However, a static website generator can create part of a site that will be served up by a web server while other pages are handled by the WSGI server. If done right, those web applications have the potential to scale better than if every page is rendered by the WSGI server. The complexity may or may not be worth it for your specific application. Numerous static website generators exist in many different languages. The ones listed here are primarily coded in Python. Pelican is a commonly used Python static website generator which is used to create Full Stack Python. The primary templating engine is Jinja and Markdown, reStructuredText and AsciiDoc are supported with the default configuration. Lektor is a static content management system and site generator that can deploy its output to any webserver. It uses Jinja2 as its template engine. MkDocs uses a YAML configuration file to take Markdown files and an optional theme to output a documentation site. The templating engine is Jinja, but a user doesn't have to create her own templates unless a custom site is desired at which point it might make more sense to use a different static site generator instead. mynt (source code) is built to create blogs and uses Jinja to generate HTML pages. Nikola (source code) takes in reStructuredText, Markdown or Jupyter (IPython) Notebooks and combines the files with Mako or Jinja2 templates to output static sites. It is compatible with both Python 2.7 and 3.3+. Python 2.7 will be dropped in early 2016 while Python 3.3+ will continue to be supported. Acrylamid (source code) uses incremental builds to generate static sites faster than recreating every page after each change is made to the input files. Hyde (source code) started out as a Python rewrite of the popular Ruby-based Jekyll static site generator. Today the project has moved past those "clone Jekyll" origins. Hyde supports Jinja as well as other templating languages and places more emphasis on metadata within the markup files to instruct the generator how to produce the output files. Check out the Hyde-powered websites page to see live examples created with Hyde. Grow SDK (source code) uses projects, known as pods, which contain a specific file and directory structure so the site can be generated. The project remains in the "experimental" phase. Complexity (source code) is a site generator for users who like to work in HTML. It uses HTML for templating but has some functionality from Jinja for inheritance. Works with Python 2.6+, 3.3+ and PyPy. Cactus (source code) uses the Django templating engine that was originally built with front-end designers in mind. It works with both Python 2.x and 3.x. This site is all open source in its own GitHub repository under the MIT license. Fork away! Django REST Framework uses MkDocs to create its documentation site. Be sure to take a look at the mkdocs.yml file to see how large, well-written docs are structured for that project. Practicing web development uses Acrylamid to create its site. The code is open source on GitHub. Linux Open Admin Days (Loadsys) has their site open source and available for viewing. The Pythonic Perambulations blog has a fairly standard theme but is also open source on GitHub. Static site generators can be implemented in any programming language. The following resources either are general to any programming ecosystem or provide a unique angle on how to use a static site generator. Static vs Dynamic Websites does an excellent job of showing the differences between a dynamic website that uses a database backend to produce content in response to a request compared with static sites that are pregenerated. There is also a second part in the series where generic static site generator concepts are explained. Staticgen lists static website generators of all programming languages sorted by various attributes such as the number of GitHub stars, forks and issues. The title is a big grandiose, but there's some solid detail in this article on why static website generators are the next big thing. I'd argue static website generators have been big for a long time now. Static site generators can be used for a range of websites from side projects up to big sites. This blog post by WeWork on why they use a static site generator explains it from the perspective of a large business. Ditching Wordpress and becoming one of the cool kids is one developer's experience moving away from Wordpress and onto Pelican with reStructuredText for his personal blog. Static websites with Flask explains how to use Flask-Frozen to generate a static site based on content from the web framework and a data source backend. This approach is an alternative to using a purpose-built static website generator such as Pelican, Lektor or MkDocs. 5 ways to handle forms on your static site gives a good overview of options like Google Forms for when you absolutely must get input from users on a static site. Deploying a static site is far less complicated than a traditional web application deployment, but you still need to host the files somewhere accessible. You'll also to set up DNS to point a domain name to your site as well as provide HTTPS support. These guides walk through various ways of handling the static site deployment. Randall Degges' Ultimate Guide to Deploying Static Sites to Amazon Web Services walks through all the steps you need to get your site up and running on S3. The guide also shows how to set up SSL certificates to ensure your site can be loaded via HTTPS. Static site hosting with S3 and Cloudflare shows how to set up an S3 bucket with Cloudflare in front as a CDN that serves the content with HTTPS. You should be able to accomplish roughly the same situation with Amazon Cloudfront, but as a Cloudflare user I like their service for these static site configurations. Google Cloud provides a tutorial on how to use them to host your static site. Note that you cannot currently use HTTPS on Google Storage servers, which is a major downside. Deploying a Static Blog with Continuous Integration uses a Hugo (a Golang-based static site generator) generated site as an example but the instructions can easily be used to deploy a Python-based static site generator output as well. How to Make an AWS S3 Static Website With SSL explains the configuration required to use SSL for HTTPS on an AWS-hosted static site. Hosting your static site with AWS S3, Route 53, and CloudFront is another solid tutorial that uses the AWS stack to deploy a globally-hosted site. Why your static website needs HTTPS shows all of the malicious activity that bad actors can cause if you do not use HTTPS as part of your static site deployment. There are few excuses for having an insecure site without required HTTPS in today's world of free Let's Encrypt certificates. How to Build a Low-tech Website? takes static site deployments to the extreme. The site served with solar power and customized hardware setup. This is a great read even though it will not be remotely practical for most organizations. What else do you want to learn about Python web dev? 1. Introduction 2. Development Environments 3. Data 4. Web Development » Static Site Generators 5. Deployment 6. DevOps Change Log What Full Stack Means About the Author Future Directions Page Statuses ...or view the full table of contents.